The first victory is ours, but the fight isn't over yet! HELLDIVERS got a whole slew of new content to keep the fight fresh on the frontlines. With new volcanic planets to explore, all new objectives to complete, and lots of new weapons and gear up for grabs, you and your fellow co-op players should be good for new content for some time. 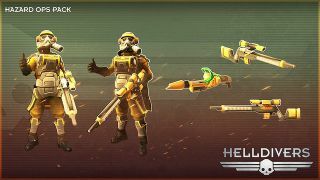 Everyone in the community pulled their efforts together to help in winning the first Galactic War of HELLDIVERS! Congratulations, gamers! However, the fight for peace and freedom is far from over. Many more factions in the galaxy are still out there and New Super Earth is far from being completely safe from attack. It's time that we bring in these new, independent races into the fold of Super Earth. Four Reinforcement Packs were also released with the expansion, which include the Demolitionist, Hazard Ops, Pilot, and Specialist Packs. Each one brings a flavor of its own to the table, and compliments the previous Reinforcement Packs perfectly. Each one is $2.99 separately, but there are some bundles to consider. 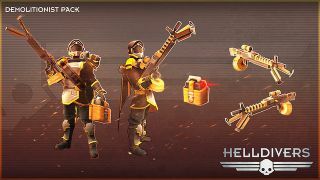 First is the Reinforcement Pack 2, consisting of Demolitionist, Hazard Ops, and Pilot Packs. 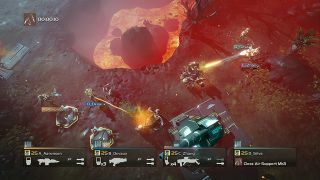 The second includes HELLDIVERS the game AND the Specialist Pack for $19.99; a great way to dive in (pun intended) if you haven't already. 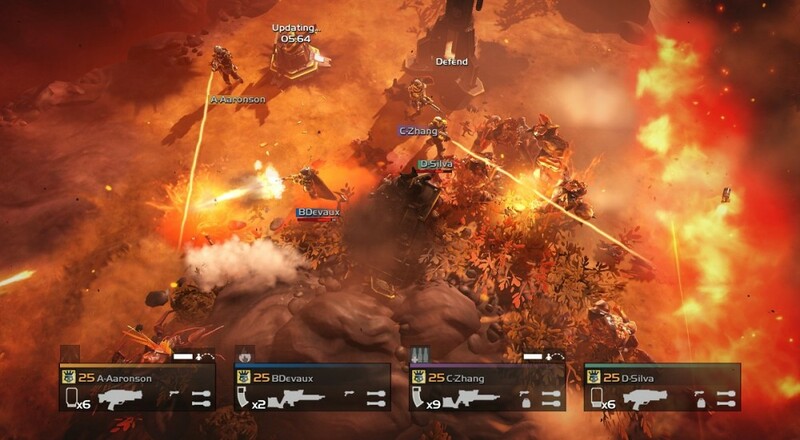 HELLDIVER Specialists are highly trained offensive support operatives. They specialize in the use of Stratagems and supportive fire. They are specially trained to receive enhanced air support. The Specialist Uniform (Helmet, Armor, and Cape). LAS-12 ‘Tanto': An ultra-compact laser SMG with extremely limited range. The short focused beam is very powerful to compensate for the short engagement envelope. Close Air Support: An ‘Eagle’ delivers a powerful strafing run followed by a pair of anti tank missiles. Effective at damaging almost all targets it does however have the drawback of being slightly unpredictable. 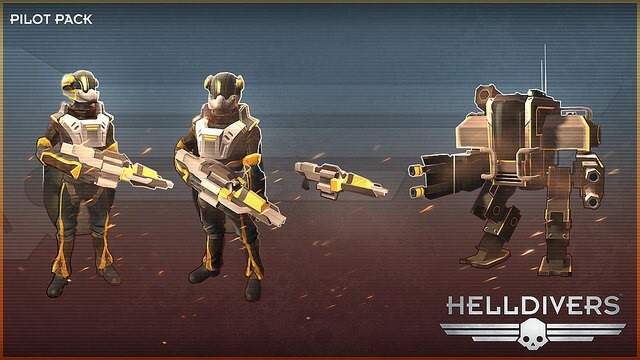 HELLDIVER Demolitionists are experts at tearing things down and blowing things up. They are rumored to be careless when handling explosives, though this is most likely just their familiarity with explosives being misinterpreted. The Demolitionist Uniform (Helmet, Armor, and Cape). MG-105 ‘Stalwart': A light machinegun based on the AR-19 ‘Liberator’. It’s very powerful when used in sustained fire, but the initial recoil is often hard to handle resulting in unpredictable spread. REC-6 ‘Demolisher': A remote Explosive Charge capable of destroying both objectives and heavily armored enemies. The user can decide when to detonate the charge by pressing the detonator. Often referred to as a Satchel Charge. The Hazard Operative HELLDIVERS are trained in chemical and biological combat and protection. Sometimes shunned by fellow HELLDIVERS for their use of inhumane warfare, many a Helldiver is happy to have them on the mission when it comes down to life or death. It’s not like the enemy is Human after all. The Hazard Ops Uniform (Helmet, Armor, and Cape). AR-14D ‘Paragon': A heavy semi-automatic rifle firing rounds similar to the AR-20L ‘Justice’, but without the penetrating capabilities. Instead the rounds are hollowed out and filled with a neurotoxin causing targets hit to become slow and sluggish. TOX-13 ‘Avenger': A high-pressure liquid projection weapon similar to the FLAM-40 ‘Incinerator’. Instead of projecting flaming napalm, this weapon sprays a very potent neurotoxin resulting in slow movements and irreversible brain damage. The Pilot HELLDIVER is specially trained to operate the wide arsenal of vehicles available to the HELLDIVER troops. Especially trained in the use of the EXO-48 ‘Obsidian’ Exosuit, Pilots are some of the few that are given the honor of using this heavily armed monster. 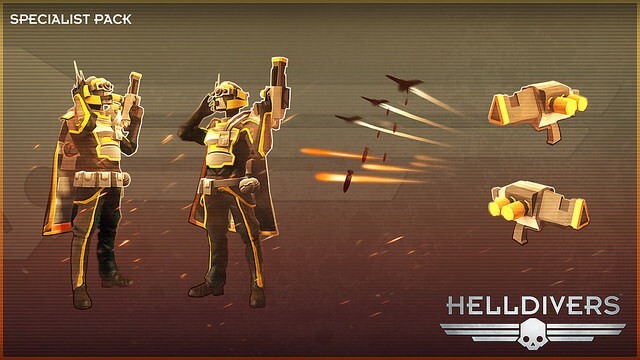 Though they prefer to use vehicles, they are still HELLDIVERS and very formidable troops on foot. The Pilot Uniform (Helmet, Armor, and Cape). AC-5 Arc Shotgun: A further development of the Arc technology, the AC-5 fires a wide, short range cone and damages everything covered by the static discharge. The charge up is much faster than the original Arc Thrower but the discharge is not quite as powerful.